Stressed? Exhausted? Temperamental? Like most creatures on this planet, humans feel an incredible amount of stress every day. The hard part is not “how to avoid burnout” (we know how to do that), but rather harnessing the willpower, the intentionality, needed for each step. A shift of mindset is required, which is the difficult part. First, you need the motivation to change. Then, you need to set a clear goal and monitor your progress. The last and most important piece of the puzzle is intentionality. Don’t forget, no man is an island, so call on your tribe to help… just make sure that you are calling on the right people. And be good to yourself! You can’t be a good servant for the Lord if you are constantly burnt out. So relax, reflect, and remember that you can enjoy a rich and beautiful life. Finally, beloved, whatever is true, whatever is honorable, whatever is just, whatever is pure, whatever is pleasing, whatever is commendable, if there is any excellence and if there is anything worthy of praise, think about these things. Keep on doing the things that you have learned and received and heard and seen in me, and the God of peace will be with you. Pick one of the four tips above and really focus on it for this week. Whether you are practicing saying “no,” getting to bed an hour earlier, or calling on a friend for help, try to stick to it every day for a week. Until we talk again, Live Passionately, Give Generously, and Impact the World for God. Like this episode? Please share or subscribe to Facebook and YouTube. Hey, this is Todd Phillips, your online pastor and personal life coach. And I want to talk today about burnout — how to avoid burnout. Because, if we are honest with ourselves, all of us have dealt with this. I can’t tell you the number of people that I’ve talked to — the number of groups I’ve spoken to, and businesses, and in churches where I say, “How many of you have experienced burnout?” The hands don’t even wait for the sentence to end. Everyone is like, “Yah!” And they could be right there right now. So I want to talk about something that is very familiar for all of us — this reality of burnout. I’m not talking about feeling overwhelmed at a given time on a given day about a few circumstances that are attacking us at a given moment — I’m talking about extended challenges that lead us to true burnout where we disconnect from career, we disconnect from family and friends, we go through depressive episodes and we feel like it’s going to last forever – real burnout! Let me just say this — I’ve been through this before. I was pastoring a large church in the Washington DC area and we had four or five thousand regular attenders every week, I had 39 staff members, we had a tremendous number of group leaders that were part of our volunteer team, and without getting it all the details I got to a point where I was burnt out. Because I didn’t really fully realize what was going on and maybe that’s you today, I don’t know, but let me encourage you with this — that doesn’t have to be the case. The bottom line is that we can avoid burnout just by taking a couple of simple steps and we’re going to talk about those today as we take this journey together. What I figured out what this — as I watched other people walk through burnout and come out on the other side better off than they were before, coming out on the other side with new practices and new habits and new paradigms of thinking. I began to read books about burnout and what it meant to sustain and live a full life in a sustainable way so that we wouldn’t experience burnout again. As I began to read these things and watch these people I came to the terms of the few key things and here’s the deal before we even get to the points, before we get to these things that you can do in your life to avoid burnout, I want to tell you that the key to this is intentionality. I think a lot of times what happens is we’ll hear something like this and then we simply won’t put it into practice these things don’t work if we don’t put them into practice, so I want to encourage you — you might even get overwhelmed by these four things that I’ll talk about. But this is what I would encourage you to do — just do one; just apply one of these things today to your life and see what happens. So let’s talk about these right now. Now, I know that sounds very simple and you’re going, “Hey Todd, listen, I’m in a job where I’m on call 24/7,” or “I couldn’t possibly go tell my boss ‘no,’ I just got to say ‘yes’ to everything.” I get that. And what I want to talk a little bit about is how do we make those decisions. Because here’s the deal — burnout mainly comes from just simply being over committed. We’ve said yes, right, to too many things. I’ve done that, you’ve probably done it, and you may be in that situation right now where you’ve found yourself saying “yes” to too many things. A lot of people who are Type A or they’re achievers, right, a lot of us tend to go out there and say “yes” all of the time and then we find ourselves overwhelmed, we find ourselves burnt out, because we’ve overcommitted. So, this is what I would suggest on this idea of saying “no.” First, whenever something comes your way, especially when it’s dealing with community or civic responsibilities — I’ll give you some idea of how we do this in my family. The second thing is family obligations. If my son or my two daughters come to me and talk to me, I engage in that and I say “yes” to those things — those are areas that I really want to lean into and they’re priorities in my life. The third level beyond spiritual and family is your career. And we just mentioned, a lot of times we simply can’t say “no” very often to too many things or we’ll lose our job. But the fourth one is community or civic. And that’s where we have incredible opportunity, ok. This is where a lot of us will think sometimes that to be a good dad or a good mom, or a godly dad or mom, or a good person within the community, we’ve got to say “yes” to everything that we’re asked. You see where I’m going, I mean it can get overwhelming just even talking about it, but a lot of us will say “yes” to all of those things because we feel like we need to. Here’s the deal, that’s a lie! And let me tell you why I say that with such conviction. We don’t have to say “yes” to everything to be good or godly or be responsible or to be a good parent — what we need to do is make sure that we make our decisions based on the priorities of our life — spiritual decisions, family decisions, career decisions, then the civic and social responsibility. And I would say this, that when trying to figure out what you can take off your plate, simply saying ‘no’ to everything else right now in that area, especially, especially if you’re feeling close to burnout. So number one — learn to say “no,” and it is a hard art to learn. Here’s where intentionality comes in. Look, science is very clear on this, science is absolutely clear on this — that we need 6 – 8 hours of sleep a night. Now let me tell you what happens if you’re not getting 6 – 8 hours of sleep. You lose focus. Your cognitive function goes down. Sickness goes up. You’re likely to cause more drama in your work environment, in your family environment. The bottom line is the less sleep we get, the bigger jerks we become. I mean that’s really the bottom line — we can’t be fully in the moment, we can’t be as creative as gods created us to be in each moment, our jobs, in our family, in our churches, if we’re not getting enough sleep. So the best way to avoid burnout for many, many people is to get rid of that sleep deficit — to sleep more. Most of us are living our entire lives sleep-deprived. And because of that, we’re not able to be all of who we need to be and who we want to be, not only for ourselves but the people around us. We’re missing out on being fully engaged — I think that’s one big thing we miss in life is not being fully engaged in each moment, in each relationship, with each opportunity to be fully engaged. Now, one of the biggest things we can do is get more sleep. This third suggestion for you today, schedule times to do your email and your social media. Now this is a really easy one in principle or in theory but very hard to do because there’s a ton of us, there’s a ton of us that are addicted to social media and email, especially social media. I mean I can’t tell you the number of people that I know right now when we go to dinner and everybody’s looking down at their phone and checking in on Facebook, or Twitter, or Instagram, or checking their emails. I mean they’re just completely attached to that phone and unable to get away. Does that describe you? Well look, it describes a lot of us, so I wouldn’t be surprised if many of us watching this right now are challenged with that. But here’s the deal — when it comes to avoiding burnout, one of the greatest things we can do in our career, in our jobs especially, those eight hours a day that we’re working, Monday through Friday if that happened to be your schedule; the best opportunity we have is to schedule times for social media and email. Now what does that look like? Well it’s a couple things. Number one is and I tried to do this in my life and it’s absolutely transformed my sense of stress throughout the day. Used to what I would do is I’d be on social media and email just throughout the day, and as an email popped up on my phone or a social media announcement popped up, I tried to respond to that. And what I did a few months ago, it’s been six, seven months now, so I’m just new into this one. What I did was I blocked off two different times each day, actually it’s three now, okay. I have three times — first thing in the morning, somewhere around lunch I’ve got it scheduled in there, and then near the end of the day, usually 3:30 or 4:00 in the afternoon, those are my three times each day to schedule my emails, to respond to them, and to schedule my social media. And my job, my emails, at my job or the first responsibility, and if I have time left over in that 30-minute slot, then I’ll address social media. One of the most important things you can do is just what I’m talking about. And very, very few people do this. The vast majority of people on this earth right now, with the technology that we have, right. We’re not doing this. We’re just responding — we’re in this frenetic connection point with our email and our social media, and it doesn’t allow us to push away, it doesn’t allow us to take a deep breath. Look, the best way to avoid burnout, to never have to deal with it, especially a career burnout, is to simply schedule these times of email and social media so that all the rest of your times throughout the day, you’re fully engaged. You’re not talking to someone at a table and then going, just a second, and you’re looking down at your phone. You’re fully engaged in that relationship, that dynamic of that meeting, fully engaged in the responsibilities of career, and you’re able to be more influential. You’re able to be more creative. You’re able to be more impactful because of that. The last way to avoid burnout is simply this, and it’s hard for a lot of us — ask for help. And this is where a peer group can really help. This is not necessarily your boss at your job or people that work for you or underneath you at your role at your job. But people that are on a level playing field with you, right. These are people who understand what you’re going through, they understand the challenges that you’re dealing with. Now some of you do that already and you know it works right, but there’s a lot of you that are going solo. And you’re on an island all by yourself. You’re not taking advantage of the people and the experience around you and you’re missing out on that opportunity to avoid burnout because you’re trying to carry the load alone. And that’s one of the most challenging situations you can be in today. So we talked about this idea of taking advantage of your peer group. It’s almost like scuba diving, right? I don’t know if you’ve ever been scuba diving but there’s this buddy concept. You always have a buddy with you so they can watch you while you’re scuba diving to see if you’re holding your breath in an unhealthy way because that can create problems for your lungs while you’re diving. They can look at your gauge, your depth gauge, and the amount of air that you have left. They’re your buddy and they can see things that maybe you don’t about yourself. And one of the greatest advantages of this kind of a buddy system in the job, right, in your career, is that that person can tell you some things about yourself if you’ll allow them into your life. They can talk to you and tell you things about yourself that maybe you don’t see, that you’re not fully aware of. They may be able to tell before you do that you’re close burnout. So, take advantage of the people that are around you. Learn to say no, get more sleep, schedule your email and your social media to blocks of time throughout the day so that you can fully engage in those other meetings and appointments and responsibilities. And finally, ask for help. Until the next time, LIVE PASSIONATELY, GIVE GENEROUSLY, and IMPACT THE WORLD FOR GOD. Hey, it’s Todd. Did you get something out the video you just watched? I really hope you did. I mean, that’s my passion—to give you something that can be applied rightly to your life, right now. Listen, if that happened, I want you to go right here, and just click on this subscription, this subscribe button, and it’ll take you straight to the page, and you can subscribe to my blog and get this content coming to your inbox every week. I hope you’ll let me do that. I hope you’ll allow us to be on this journey together. See you soon! Share this page! Invite your friends to go on this journey of discovery and impact with us! All net proceeds will go towards The Last Well goal of providing free, clean water and the Gospel to the entire nation of Liberia by 2020. 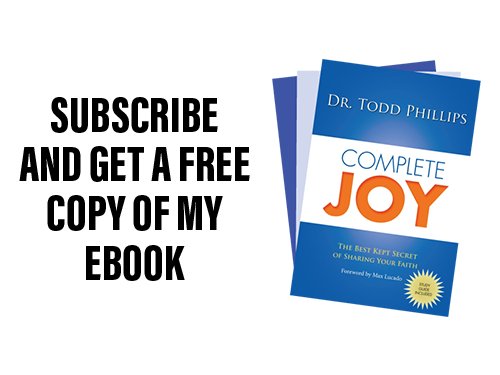 Subscribe to my weekly devotional emails and I’ll send you my FREE e-book copy of “COMPLETE JOY: THE BEST KEPT SECRET OF SHARING YOUR FAITH.” In it, I’ll show you one of the greatest truths in the Bible and share with you the secret of living life with complete joy! It’s my gift to you for joining me on a life-long journey of becoming difference-makers together. This entry was posted in Blog, Spiritual Development, Stress, Videos and tagged burnout, burnt out, motivation, Phillipians, stress, worry. Bookmark the permalink.